This page is starting to get out of date. It was last worked on in 2001 and several things have changed since then. Due to the heat generated, the elevated electricity bills, and boredom with the collection and collecting in general, all of the machines have been retired. 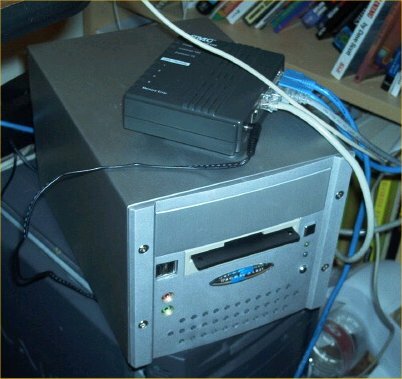 The most recent of which was an old K6 that I was using as a Jack of All Trades OpenBSD server. It ran non-stop for years and then one day decided to blow a network card. It wouldn't have taken much to fix, but I paused and asked myself if I really wanted to be a system administrator for my own home or if I would prefer things as simple and trouble-free as possible. Trouble-free won. 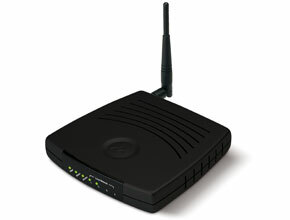 The server is gone, replaced with a Wireless Motorola Router. The router has given me no problems whatsoever since I plugged it in and configured it. It just works. As a bonus, I save some cash every month. The router uses much less power than the OpenBSD box, doesn't require that I crank up the A/C, and I am no longer paying for a domain or the dynamic DNS service. What I've been reduced down to (said in good way, mind you), are two Apple iBooks, and when I'm energetic enough to connect it, a Shuttle PC. My mass storage needs that were provided by the server have been replaced with a power-less Firewire hard drive. Anyhow, what follows is what I used to have. I guess I'm not really that geeky anymore. This page has several large images, so be patient; it will take a while to load. This is a virtual tour of the computers that I own. It's really not all that exciting, but you might get a kick out of it. Some things have changed, such as I don't use my computer room much anymore. Ever since I purchased an iBook, most of my computer use shifted from the computer room to the living room couch. Also, my gateway/router setup is now different. It's now all handled from a single OpenBSD box, rather than dedicated hardware. 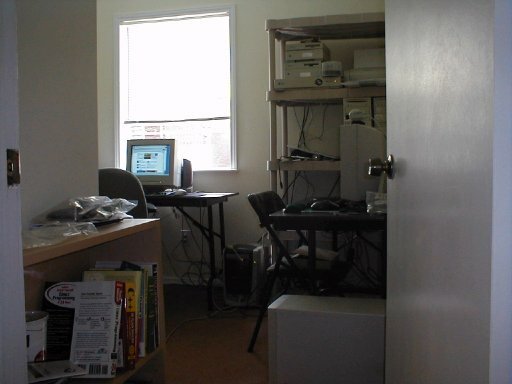 This is what you see when you open the door to the computer room. The monitor in the middle was my main computer known as fredhp (very original name, I know). The shelves on the right hold five computers. This computer is known as desktop (again, very original naming here). 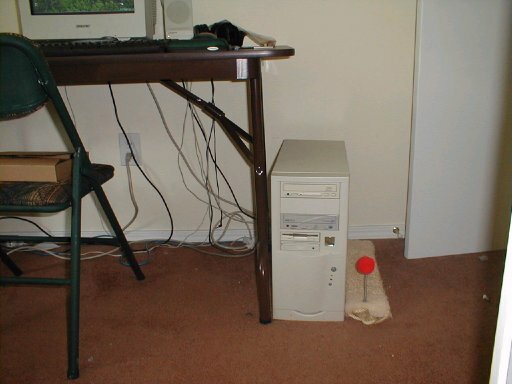 It runs Windows 2000 and is mostly used for games. Here is fredhp, also running Windows 2000. I use it for software development. Lester runs FreeBSD, and willy runs Slackware Linux. Willy used to be my primary server until I got the OpenBSD box. I picked these computers up at the Goodwill computer store for dirt cheap. 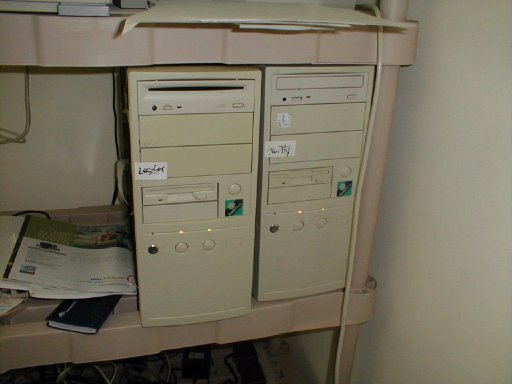 The two smaller computers on top are yoda and chewy, both Sparcstation IPCs. They weren't named by me, but rather these were the names they had when I bought them. Only yoda works, and is running RedHat Linux 6.2. Chewy has a dead battery, which needs to be replaced. 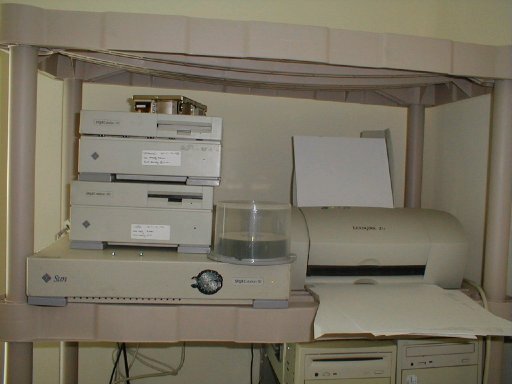 On the bottom is a Sparcstation 10 known as meyer. 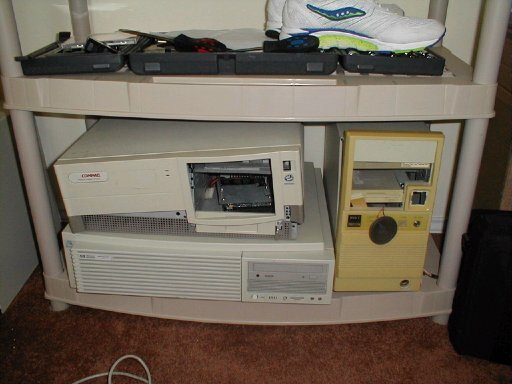 It also runs RedHat Linux (despite the blowfish on it). 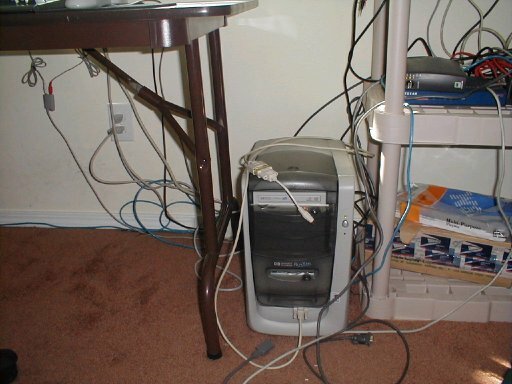 Here was my gateway/router setup. 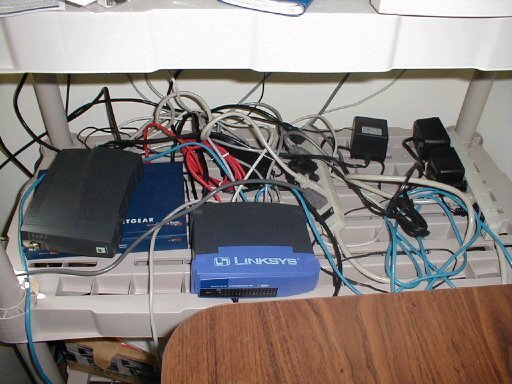 A cable modem, a Netgear gateway/router, and a 16-port hub. And here it is even closer. I am the king of neatness. Big and purple, it's not Barney, but rather tyler. Tyler is in constant flux. For a while it ran QNX, then Windows 2000, then Slackware, then OpenBSD. Right now it's not being used for all that much. Here is oscar on the left and tyler's head on the right. 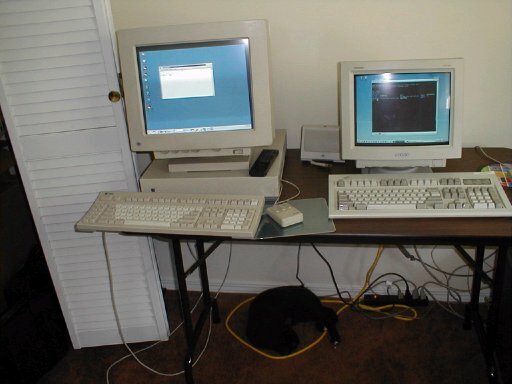 Oscar is a Sparcstation 5 running SunOS 2.6. 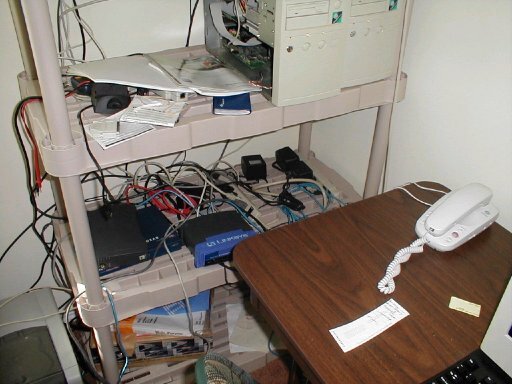 The computer on the bottom is unnamed. It's a HP 9000 C180. My favorite computer, even though I never use it or even turn it on. Its 64-bit computational power heats the room to an uncomfortable level rapidly. On top of the HP is the original willy. It looks kind of sad, doesn't it? To the right is a 386SX that I used for parts. This computer, lister, runs OpenBSD and replaces the router and gateway, as well as being my primary server and development box. It's a fairly powerful box, with a 900MHZ processor and 1GB of ram. It's super small and super quiet. It is seen here sitting on top of tyler, which has been its home since October (I really need to tidy this room up). 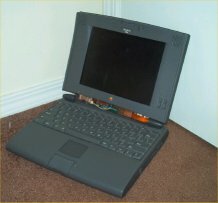 This is an old Powerbook that I used for lounging purposes, for a while. I bought it from Ebay. When I got it, its battery couldn't hold a chage. A few days later, the plastic at the bottom of the screen popped off. A month or so later, the whole screen broke off, except for the hinge on one side. As far as PC laptops go, I really believe HP and IBM are the best. Although the picture isn't particularily good, this is my HP laptop. It was also acquired through Ebay. It, however, had a slightly longer life than the Powerbook. It's a Pentium 133, with 32MB of RAM. 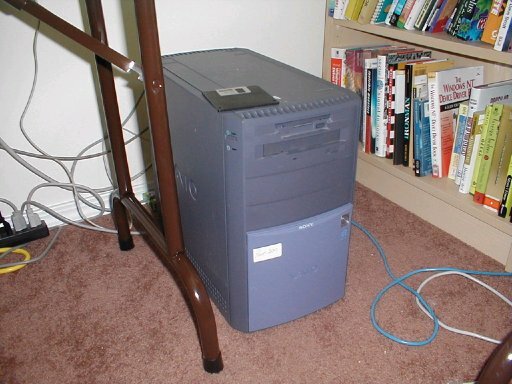 I ran Windows 2000 on it without a problem. Then one day I noticed that the screen was quite dim. I had been gradually growing aware of it for the past several days, but it didn't register to me that anything odd was going on until it became painfully obvious. 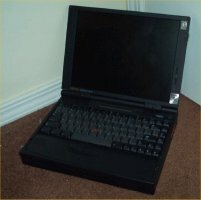 This computer still works, but in order to use it, it either has to be in complete darkness, or attached to an external monitor. two more computers to come!